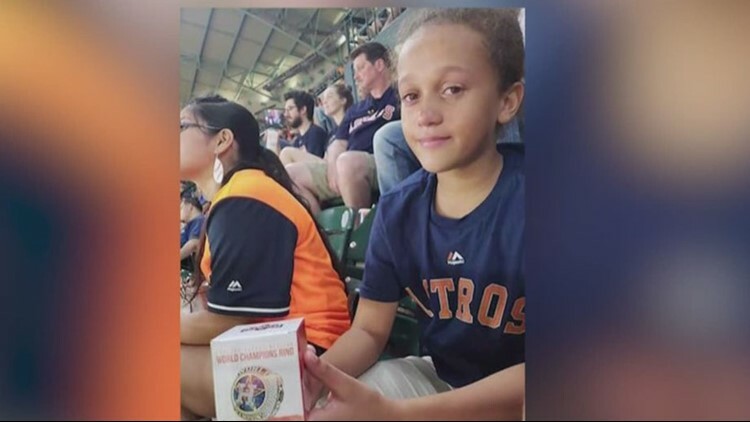 HOUSTON - The kind Astros fan who gave his World Series replica ring to a little girl after she lost hers has been found. His name is Brent Partin and, luckily, his friend saw Tuesday’s story about him on KHOU 11 News and identified him. 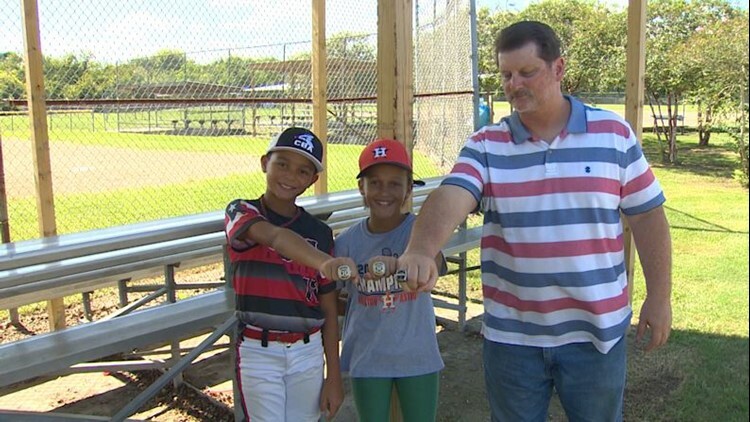 The search for the kind Astros fan who gave his World Series replica ring to a little girl after she had lost hers has been found. The little girl and kind stranger were reunited on Wednesday and, come to find out, the reason he gave Cali Austin, 11, his ring warrants a story of its own. “Thank you,” Cali said when she met Partin, followed by a big hug. Related: She lost her Astros ring, and he gave her his! On Monday night, Partin was sitting behind Cali, her brother Cash and their family, when he realized she had dropped the ring over the railing of section 311, all the way down to the club level below. Cali was in tears after she lost her World Series replica ring at an Astros game. “I was watching her, and she turned around, and I saw those tears and said, ‘That’s it. I can’t. It’s breaking my heart.’ So I had to give it to her," Partin said. A picture her mom snapped captured the next moment: tears still fresh in Cali’s eyes, a new ring in her lap from the stranger behind her. That act of kindness didn’t take much thought from Partin. After all, he could relate to the family in front of him as he used to take his little girl to ballgames, too. “She was a really good daughter. Could not have had a better daughter," Partin said. Her name was Allison and, through tears, Partin explained that she passed away when she was 20 years old. Something like this, a story that’s been shared countless times on social media and inspired Cali and her brother Cash to find a stranger and give him a little something of their own. “I have something to give you,” said Cash, 10, as he handed Partin a little black velvet bag. Inside was his championship 9 and under AA ring that he won this past season. “It’s one of the rings that I won from my baseball team. We worked hard to get it," he said. Sometimes the smallest gestures can make the most profound impacts. “We’re all God’s creatures, and if we can’t all show a little kindness and respect, I don’t know where this world is going to go to, so, it was my pleasure," Partin said. Partin has gotten countless offers from strangers who say they’ll happily give him their own rings. However, on Wednesday, the woman who found Cali’s ring came forward once she had heard the story. Kelsey Stansberry said she was surprised when the ring dropped right into her lap Monday night. She says she looked around trying to find the owner and eventually took it home with her. She lives in El Campo and says she will be mailing it to Partin.